I would lie if I said I didn’t love my alone time in the bathroom. Really, as crazy as it sounds most of the time there are a least two conversations going during my evening bathroom routine. Someone needs a hair brush, the iPad battery is dead or the dog rolled in skunk spray…yep my life is exciting. Soft Soap sent me a collection of their Soft Soap Fragrance and Body Butter Collection to make my bathroom time a little more enjoyable. There are nine different luxurious blends to try out Shea Butter, Coconut Scrub, Heavenly Vanilla, Strawberry Scrub, Black Orchid & Velvet Hibiscus, Juicy Pomegranate & Mango Infusions, Creamy Milk Protein & Honey and Citrus Splash & Berry Fusion. Just adding the bottles to my bathroom has given it a little more colour & sparkle. Strawberry Scrub is my “go to” morning shower body wash, it wakes me up without being to overpowering. KT loves the Shea Butter because it reminds her of the beach. My DH, who has never used a body wash before, loves the Coconut Scrub but he didn’t want me to write that on my blog cause men don’t use body washes…ok then. Now would you like a little oasis in your bathroom? 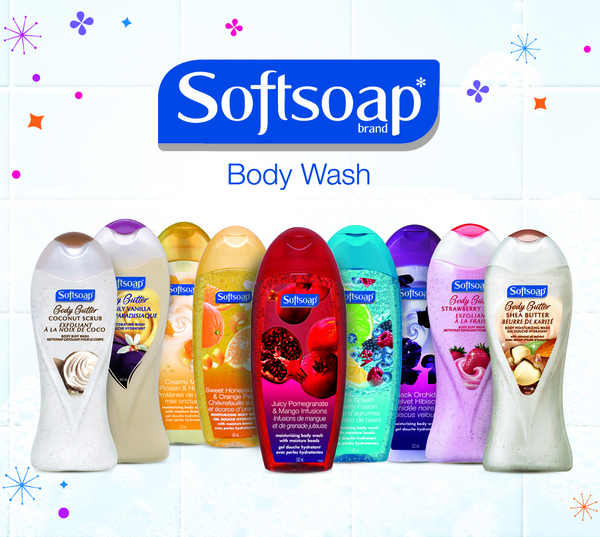 Softsoap skin is in TM, is giving my readers a chance to win the same collection I received. Leave a comment and tell me in the Rafflecopper that you did. For bonus entries follow the links! Winners will be announced on April 9th/2013. ← Kathy Buckworth, Books & Lattes ! I’m with KT – beach all the way. Most interested in trying out the Coconut Scrub. Thanks for the giveaway! I’m torn between the coconut and strawberry scrubs and the pomegranate-mango scents. They all sound lovely! I’d love to try the heavenly vanilla one. Yummy! I would most like to try the Sweet Honeysuckle and Orange Peel. i am most interested in the Heavenly Vanilla. That one is definitely something I think I would love!